Your doctor always talks about the importance of exercise, your whole life you are told how important it is to be outside and be active, but as you get older it becomes even more important. But as you get older, it can be harder to get out and be active, your bones are more fragile, your muscles have become less toned and your heart slows as you age. 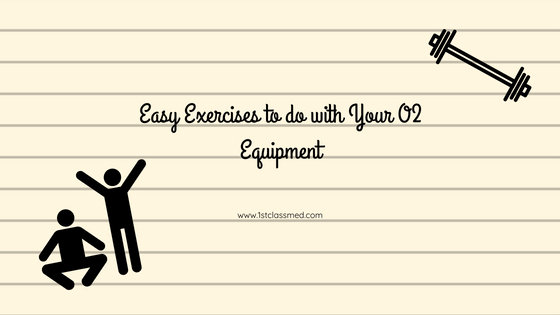 It can be even more difficult to exercise when you have oxygen equipment with you at all times. Portable oxygen concentrators can make it easier for you to exercise as they can go with you and make it easier to move around. Before you exercise, it is important to make sure your concentrator is ready to exercise as well. Make sure your concentrator is fully charged, because it would not be ideal to have your machine die during your workout. When you are done exercising, make sure you have at least an hour of battery remaining on your machine, so you have enough oxygen to help you during your cool down/recovery time. Extra cannula and a humidifier bottle are important to bring along in case the cannula breaks, or you feel like your nose is getting dry from the workout. It is important to wear the right clothing and shoes when working out, in order to prevent any injuries or discomfort. Fitted clothing is best, as baggy clothing can get caught on surrounding objects and can end up hurting you. Make sure you are wearing a good pair of shoes when exercising as well, as good shoes can help give you stability and support for your legs and back while you exercise. If you are unsure about the right shoes, go to a shoe store and ask to get properly fitted for a pair of shoes. The associate can also recommend the right pair of shoes based on the activities you plan to do while exercising. Before exercising, it is important to stretch, for the best stretching methods for you, speak with your doctor about what they recommend for you personally. The top recommended exercise method is to go walking, as walking is very good for your lungs, heart and muscles. No matter where you choose to walk, outside, indoors or on a treadmill, it is important to make sure the surface is level and there is nowhere for your feet to get caught up. When walking, you can have a neighbor or friend come with you and walk around the neighborhood or a park. It is important to check air quality reports and try to walk early in the morning or in the evening to avoid the hot sun and humidity in the summer. The winter may be harder for you to walk in, as the snow and ice can make sidewalks slick, so it may be best to walk indoors during that time of year. Overtime you may feel like there is not much of a challenge from walking the same path often, so change it up and challenge yourself. Find an incline to walk up or change your pace to give yourself more of a challenge. 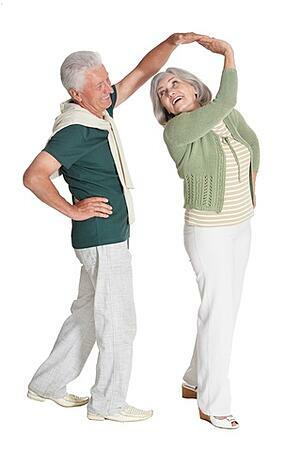 One of the best (and most fun) forms of aerobics is dancing, and it is easy to do with a portable oxygen concentrator. Not only do dance studios have cool air conditioning to keep you from getting too hot, but you will have access to power outlets for your machine and fresh cold water to drink. Contact your local recreational center and see what type of classes they offer, or you can look into professional dance studios as they often have classes available for beginners. Start off with a beginner class and invite some friends to join you and see how your body can handle that level of exercise and movement. As you feel less challenged, you can look into more challenging classes and see what more you can learn. After becoming more familiar with dance and movement, you can start dancing at home more often and have friends come over for a fun night of dancing. Though it may seem like stationary bikes are a thing of the past, they are great for individuals with bad joints and backs. Many gyms offer a handful of different styles of stationary bikes, and you can pick which one is most comfortable for you and your body. With a bike lower to the ground (recumbent bike) you are provided back support and a place to set your oxygen, on the floor or a basket attached to the bike, it is a perfect fit for those with may struggle with back pain. 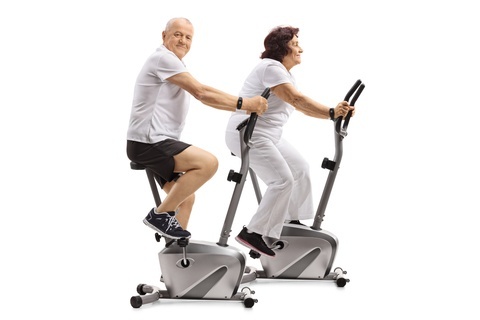 Upright bikes are also good for those with oxygen as well, as many upright bikes also have baskets for your machine to rest in while you exercise. Bikes are great to strengthen your legs, your heart and help with your endurance without putting too much pressure on any joints or bones. While biking focuses on your lower body, we don’t want to forget your upper body. Your upper body does a lot of physical activity for you day in and day out, it helps turn on light switches, send an email, change the channel and brush your teeth. While we use our upper body a lot, if we do not continue to exercise it, it can get slow and weak. If your muscles are less toned and you notice you are having issues opening jars, using resistance bands can help regain your strength. By buying multiple strength bands, you can progressively strengthen your muscles and make it easier to do daily activities that have gotten harder to do. By standing up, placing a band under your feet and holding each end of the band in either hand, you can start to do arm curls. Your forearms should be underside facing the ceiling and slowing bring your hands to your shoulders. This will help with your forearms and biceps and help regain those muscles overtime. These are all easy ways to help regain strength in multiple parts of the body, all while doing simple exercises that many people can do. Now some or all of these exercises may not be a good fit for you, depending on your age, healthy and any past injuries. It is important to speak with your doctor before you do any physical activity, as they will know what exercise is best for you. Your doctor is a great resource for your health and your well being, they will be able to let you know more about what you should be doing for your own health.